Twitter celebrated its eighth birthday last month and new people and businesses are still joining every day. According to Twitter, there are 288 million monthly active users sending around 500 million tweets each day. How exactly is your business going to stand out in a crowd like that? If you finish this blog post with one nugget of advice, I hope it’s this: be authentic. Twitter itself suggests that the best tweets share meaningful moments — big and small. People follow companies (for a variety of reasons, including) to get a look behind the curtain, and see who you really are and what you’re all about. Here are a few easy-to-implement tips to get you started and to keep in mind as you grow your Twitter base. What is it they say about pictures? Tweets with images result in more engagement whether you measure Retweets, Favorites or Replies. You have a limited number of characters to work with. Including an image uses a finite number of those characters, but you know what they say: A picture is worth a thousand words. First is better than third. Even if you’re tweeting as a company and not an individual, use first person language. Say “we,” not the name of the company. Never include your own handle in a tweet. Twitter is all about conversation. 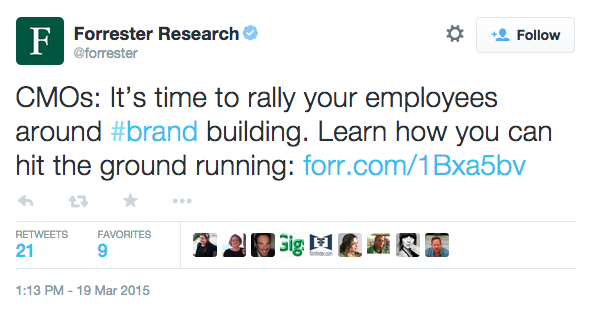 If your Twitter account seems boring and sterile, your company may seem that way, too. 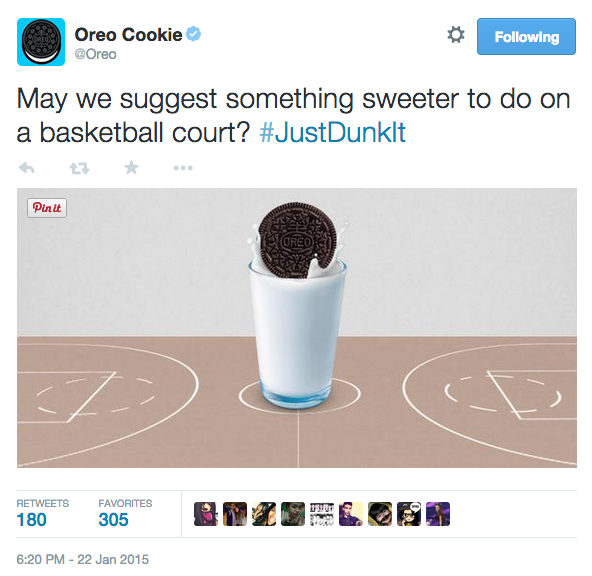 Oreo is a great example of a lighthearted and personable Twitter account. Twitter is practically designed to help you be coy; take advantage. 140 characters are all you have to intrigue people and entice them to click on your content. While teasing your information, also be clear with your wording as people are more likely to click on your link if they know what to expect. If you tweet around your industry and about the things that you find interesting, it’s likely that your followers might also find it interesting, even if it’s not directly related to your products or services. Not every tweet is going to close a sale or gain a new follower. You’re trying to promote conversation and engage with your followers. For example, Nike has built a very successful and recognizable brand. Some of their tweets are about the fitness industry without pushing anything they sell. In the example below, they do include their tagline as a hashtag, but this tweet doesn’t tell you anything about their products. Have you picked up on any trends in engagement among your followers? Do you get more retweets or mentions on certain days of the week or even at certain times of the day? Pay attention to engagement by day and time and see if you pick up a pattern. (By the way, you should also be checking out your Twitter Analytics for other great stats on your account!) For B2B companies, we typically see peak engagement on weekdays after 11am ET, and it’s pretty quiet between 8pm and 9am ET as well as on the weekend. Hashtags are a great way to extend your reach. You probably have a goal to increase the number of your followers, and an easy way to reach potential followers is to include hashtags in your tweets. Be sure to search and include hashtags that already have a strong presence. New, custom hashtags can also be included in your next campaign to promote conversation and engagement.